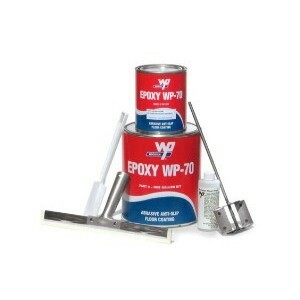 WP-70 Non-Skid Epoxy Coating - Safety Coatings | Mats Inc.
Trowel on, 2 part epoxy system for extreme, durable, long lasting solution. For industries, such as breweries, canneries, or off-shore drilling platforms. Extra thick consistency requires trowel and squeegee application. Packed 1 gallon kit per case. 25 - 30 square feet coverage per gallon. No flash or volatile solvents, low voc. 18 - 24 hour cure time. 30 - 60 minute pot life once mixed. Squeegee and mixing blade not included. Available in black, gray or yellow.